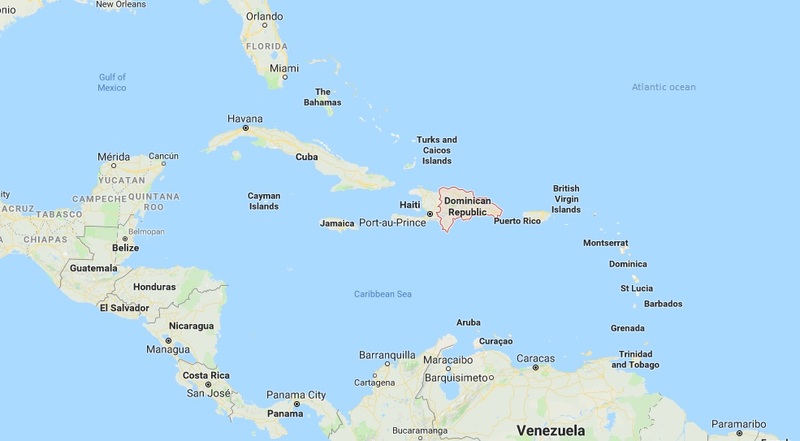 The Dominican Republic is located on the eastern two-thirds of the island of Hispaniola and is 48,734 square kilometers (18,816 square miles. The western portion of the island is occupied by the republic of Haiti. Hispaniola is near the center of the West Indies, a group of islands that extend from Florida to Venezuela. To the north of Hispaniola is the Atlantic Ocean, to the south the Caribbean Sea, to the east Puerto Rico, and to the west Cuba. Hispaniola, Puerto Rico, Cuba, and Jamaica are referred to as the Greater Antilles. The mountains of the Dominican Republic divide the country into northern, central, and southwestern regions. The northern region includes the Cordillera Septentrional (northern mountain range), the Cibao Valley, which is the country’s major agricultural area; and the tropical Samaná Peninsula with its coconut plantations and bay, where humpback whales breed. 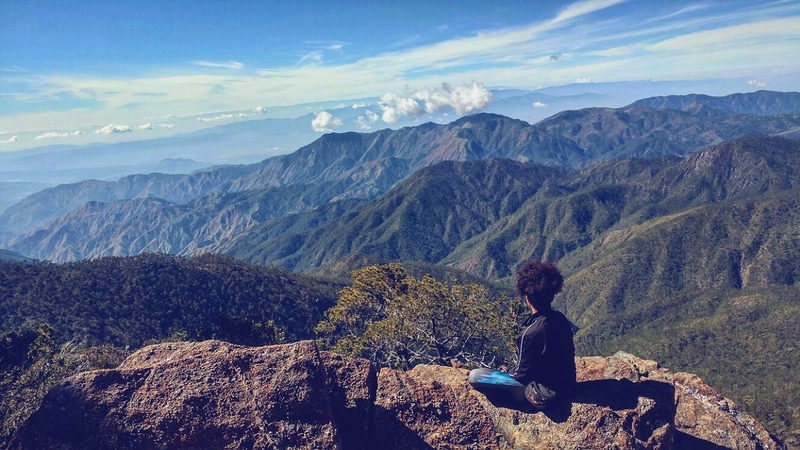 The highest point in the Caribbean is Pico Duarte, which reaches an elevation of over 3,175 meters (10,414 feet) and has alpine forests near the summit. The central region is dominated by the Cordillera Central (central range) which ends at the Caribbean Sea. The Caribbean coastal plain includes a series of limestone terraces that gradually rise to a height of about 100 meters (328 feet) and has sugarcane plantations. The southwestern region lies south of the Valle de San Juan and encompasses the Sierra de Neiba. Much of the region is a desert and it includes Lake Enriquillo, the island’s largest lake. Lake Enriquillo is a saltwater lake that lies 46 meters (150 feet) below sea level and is inhabited by unique fauna, including crocodiles, huge iguanas, and flamingos. The most significant river in the country, with a drainage basin of 7,044 square kilometers (2,720 square miles), is Yaque del Norte, which starts at Pico Duarte and empties into the Bahia de Monte Cristi on the northwest coast. The capital, Santo Domingo, was the first permanent European settlement in the New World and was established by Spain in 1496. 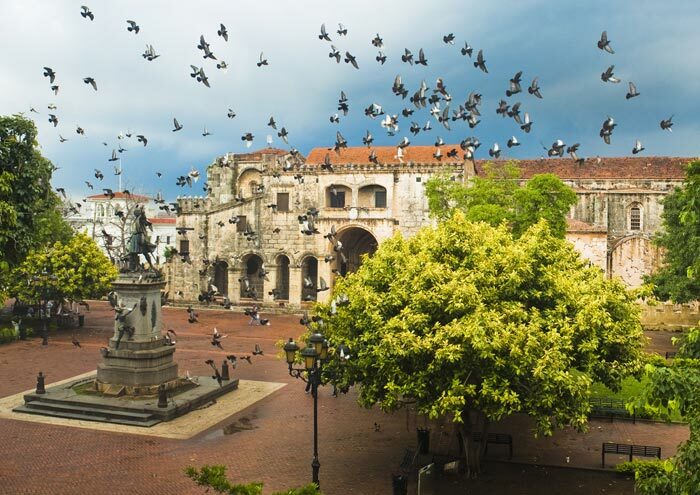 The Colonial Zone of Santo Domingo is one of the great treasures of Spanish America today, with many original buildings intact and restored. For its stunning variety of ecosystems, the Dominican Republic is like a continent squished into half an island. Lowland rainforests, cloud forests, pine forests, dry forests, mangroves, savannah, coastal lagoons, salt lakes, a rift valley, karst land formations, four mountain ranges and of course some of the best beaches in the world. Yet, most tourists who visit the Dominican Republic never venture out of their all-inclusive resorts, missing out on some of the most stunning landscapes and accessible wildlife viewing in the Caribbean. 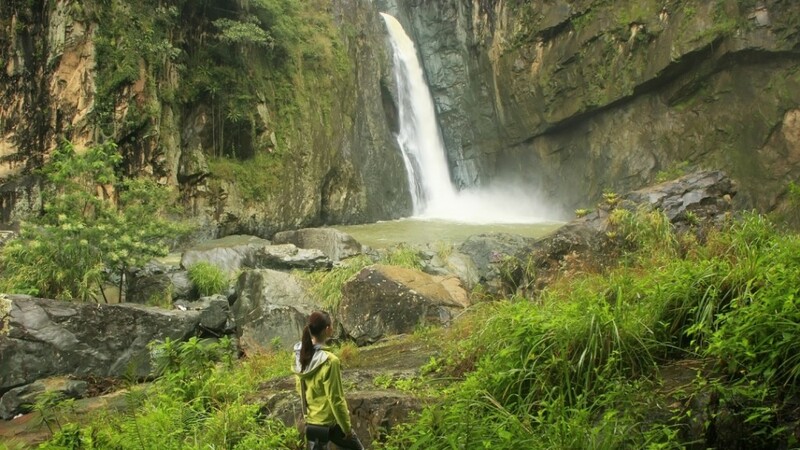 Driving through fields of sugarcane, palm oil plantations, rice paddies, small villages, and cattle ranches, one suddenly stumbles onto a resplendent land of sharply-toned karst mountains blanketed in rainforest., all that available in Los Haitises National Park. Entering the park starts with a boat ride through pristine white and red mangrove forests—as brightly-colored crabs scuttle away and shore birds watch unimpressed. Eventually the mangroves open out onto San Lorenzo Bay. Here, turkey vultures circle high above slowly eroding karst islands while pelicans and terns dive for lunch. 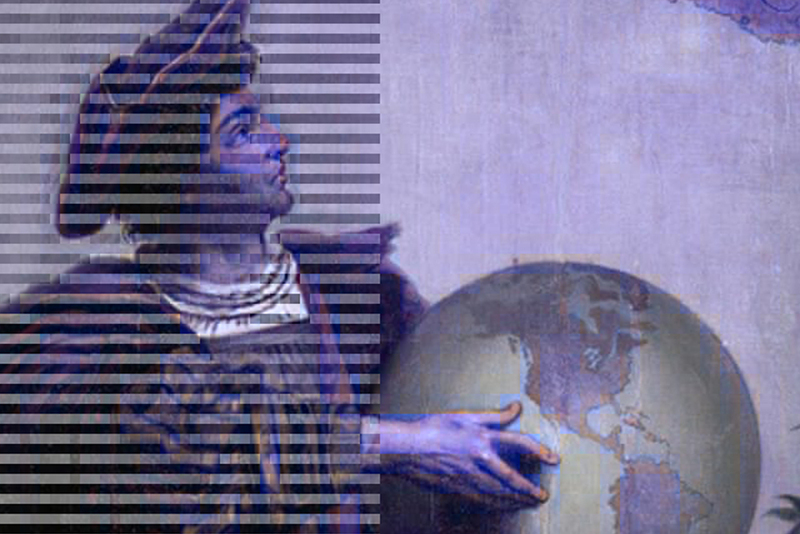 One has a sense of being transported back to the day Columbus reached the island of Hispaniola. 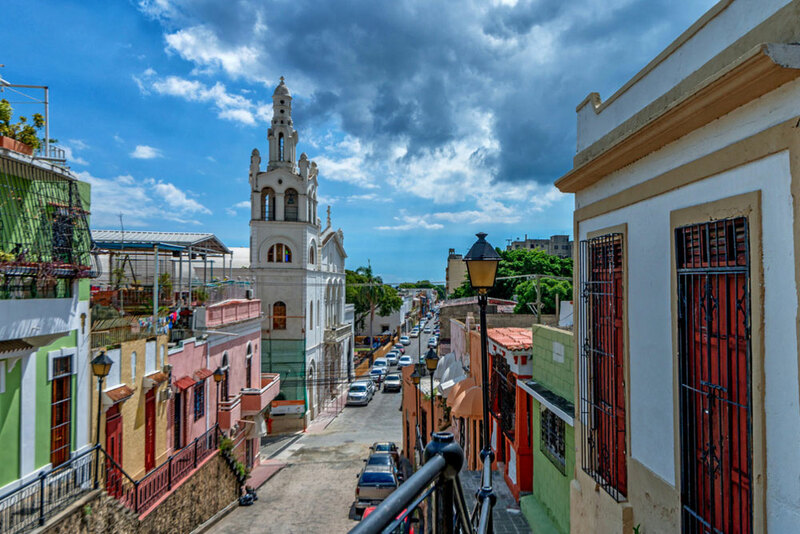 Columbus’ impact is unmistakable in much of the Dominican Republic—the explorer’s first permanent settlement was in the country—in Los Haitises it’s the earlier inhabitants of the island that have indeed left their mark. In caves hollowed out by millions of years of rainfall, the Taino people, who first arrived on the island around 650 AD, carved somber stone faces and deftly painted pictographs of the world around them: whales, water birds, fish, dogs, and native mammals. Back outside the caves, one can hike straight into untouched rainforest. Over 700 plant species have been identified here, including 17 endemic to the region. In addition, 110 birds are found in the park, making up just a part of the birds found in the Dominican Republic. The park is also the only home of the Ridgway’s hawk (Buteo ridgwayi), one of the world’s most endangered birds and arguably the most endangered raptor. The Dominican Republic is replete with wild places to visit, all within a few hours drive of Santo Domingo. In fact, the least visited region in the Dominican Republic is also considered as the most stunning: Pedernales Peninsula. This peninsula is almost like the Dominican Republic in miniature due to its stunning mix of ecosystems in such a small geographic space. There’s the rain-and-pine forest mountains to the north, a completely bizarre dry and scrub forest (like a vegetated desert) across most of the plains, vast lagoons on the edge of the sea, and the least-developed and most jaw-dropping coastlines and beaches in the country. Jaragua National Park and Bahoruco National Park: Together these two national parks on the Pedernales Penninsula are a part of a UNESCO World Biosphere Reserve. Jaragua to the south is home to a vast landscape of scraggly drylands with bizarre, thorny, uninviting vegetation that makes the area appear like you’re driving on another planet, until you run into a stray cow entering the parklands. Here, you can visit Oviedo Lagoon, a hypersaline lake (i.e. high in salt) that hosts a broad array of shore and seabirds, including flamingoes. Another trip can take you to the seven- kilometer-long Las Aguilas Beach, which is arguably the most remote and stunning beach in the country. There is absolutely no development on the beach—and plans to build resorts have been locally opposed to date—allowing you to swim in impossibly clear waters, watch seabirds, or scurry after hermit crabs in peace. Pedernales town the town is a cultural experience unto itself: an invasion of motor bikes, Dominican “country” music known as bachata, and an unmissable border with Haiti through which immigrants pass. To get a real sense of the culture here, visit the town square around ten PM on a Saturday night: this is where locals come to drink, flirt, chat, and drive their motorbikes in endless rotations around the square. 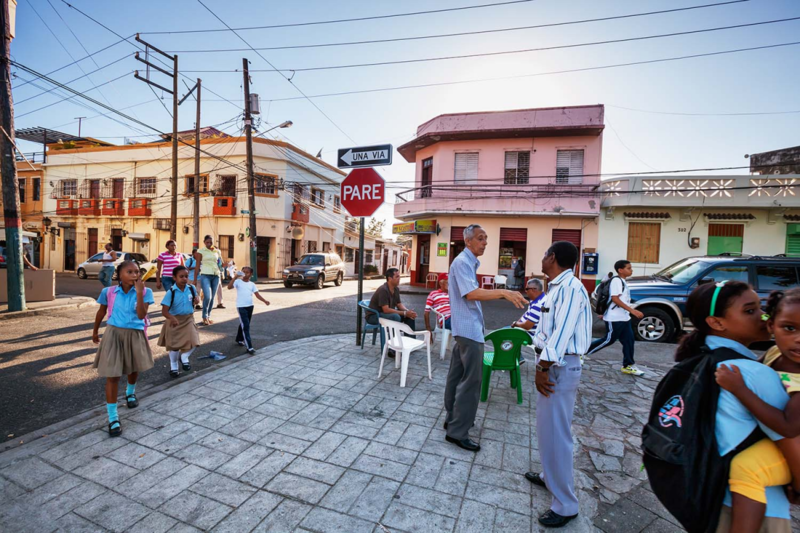 Pedernales is also home to one of the border crossings from the Dominican Republic to Haiti. One of the most interesting cultural experiences in the town is the Haitian market held two days a week. The border opens for the morning allowing Haitians to come over and sell their wares. At this open-air market, you’ll find literally everything. Other highlights: Every region of the Dominican Republic, however, has its jewels. If kayaking with manatees in a lagoon sounds like your idea of heaven (including kayaking through pristine mangroves) you can do this at Estero Hondo Marine Sanctuary in the northern part of the country. To see other even larger marine mammals travelers can view humpback whales from January-March along the Bay of Samaná, to the east. Alligators, flamingoes, and iguanas are the attractions at the lowest point in the Caribbean: Enriquillo Lake; or just a few hours away climb to the highest point in the Caribbean, Pico Durante, at 3,093 meters. Hanging around with monkeys and horse-riding are possible in La Romana. One can also hike through cloud forests at the Ebano Verde Scientific Preserve or the Quita Espuela Scientific Preserve. Of course, great spots for snorkeling and scuba diving abound across the country. This beautiful island is steeped in history and culture worthwhile exploring: abundant historical sites, museums, colonial architecture, the first hospital, first sugar mill, first Catholic church this side of the world. Visitors will soon discover that the Dominican Republic offers much more than the typical Caribbean attractions of sun, sand and sea. 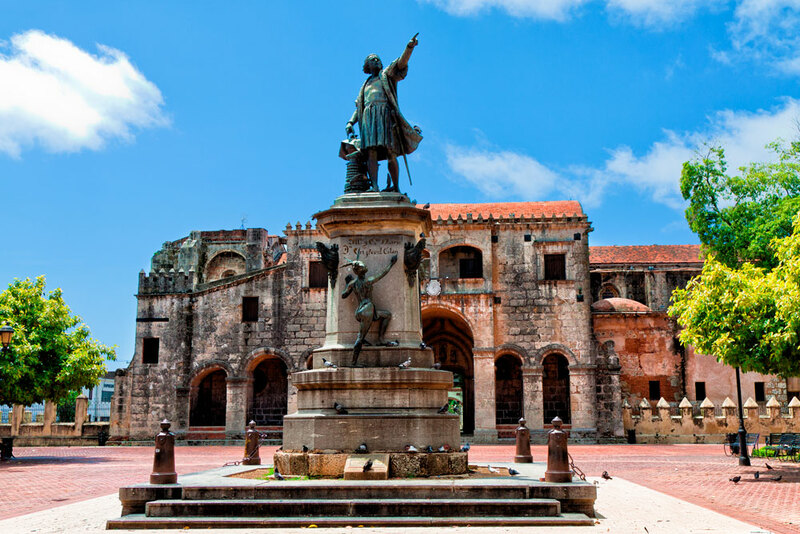 Santo Domingo, the capital city, boasts the Alcazar de Colon (Columbus’ Palace): the 22-room palace home of Don Diego Columbus and his family. Built in 1510 and restored in 1955, its structure combines a Gothic-Moorish style with Spanish and Italian Renaissance features. The Alcazar Museum, adjacent to Columbus’ Palace, houses religious and colonial art objects that date back to this era. The Cathedral of Santa María was built in phases between 1510 and 1540, although the bell tower was never finished. Pope Paul III pronounced it the first cathedral in the New World in 1542. The style comprises late Gothic and Renaissance elements. La Torre del Homenaje (The Tower of Homage), the oldest military construction in the New World, built in 1503, served as a prison until the 20th century. Las Ruinas del Monasterio de San Francisco (The San Francisco Monastery Ruins), built around 1556, and is the oldest monastery in the New World. The four churches that follow are among the quaint group of churches dating back to this colonial period. – Iglesia del Convento Dominico (A Church of the Dominican Order), shaped like a Latin cross, has unique, outstanding altars, dedicated to the “Miraculous Virgin,” and the “Most Holy One.” The latter features four apostles sculptured in patina-coated stone. – The gothic-style Chapel de La Altagracia and the Chapel of Nuestra Señora del Perpetuo Socorro, the latter with four Ionic columns, joined by an architrave, dominated by a model of the morning star that announced Christ’s birth. – Santa Barbara is a restored colonial church and fort, featuring late Gothic elements harmoniously combined with Baroque detail. – Iglesia de los Padres Jesuitas y Panteon Nacional (A Church run by the Jesuit Fathers and National Pantheon) was built in 1743 as a Jesuit church, but then restored and converted into the National Pantheon in 1958. It has then become the resting grounds for leading national heroes. The central nave forms a cross with the lateral chapels, and a bronze lamp, donated by the Spanish government, hangs in the intersection. Casa de Cordon (The Cord House), the first Spanish-style home built in the Americas, was erected by conquistador Francisco de Garay. Surrounding the building was a beautiful gate trimmed with a cord resembling those used by San Franciscan monks. Today it is a cultural center sponsored by Banco Popular. Santo Domingo boasts 10 museums, with exhibits ranging from semiprecious gems to prehistoric art from Spain and Portugal. The Numismatic and Philatelic Museum is said to possess the most comprehensive and valuable collection of antique coins, bills and stamps in the Caribbean dating back to 1865. The Museum of the Dominican Man traces the origin of Dominican people back to the original Taino Indians and artifacts, including the Spanish conquistadores and African slaves. The Columbus’ Lighthouse, a towering structure in the form of a cross, constructed to commemorate the 500th anniversary of the discovery of America in 1492. It houses the explorer’s remains, museums and exhibits donated by several countries. The edifice’s 151 light beams can be seen 40 miles away. Other museums include the National Museum of Natural History, Museum of the Dominican Family, National Museum of History and Geography, Museum of Modern Art and Museum of the Royal Dockyards. Theater enthusiasts can visit the National Theater, which holds up to 1,700 people and features theatrical, musical and dance performances. The Theater of Fine Arts hosts cultural events and exhibits. Casa de Teatro is a nonprofit institution where people can express their knowledge and ideas about culture, art, theater and concerts in an open forum. The Amber Museum of Puerto Plata, set in a Victorian mansion, features a large array of prehistoric amber-encased specimens. The Museum of Taino Art, providing insights into the people who first inhabited the Dominican Republic.